Ping monitoring is one of the go-to techniques that an administrator uses to check the availability of network devices. But what is ping monitoring? Ping monitoring is where a user pings a device and waits for a response. The monitor then assesses the connection strength based on the response time. Using a ping scan software tool to monitor your devices can tell you whether a device is up or down. Monitoring your network in this way gives you a clear perspective of the health of your key devices. In this article, we’re going to look at the best ping monitoring tools on the market. SolarWinds Engineer’s Toolset (FREE TRIAL) – This set of more than 60 tools includes a Ping Sweep tool and other utilities that rely on Ping. PRTG Network Monitor (FREE TRIAL) – A large set of monitors including the Ping Sensor, the Ping Jitter Sensor, and the Cloud Ping Sensor. ManageEngine Free Ping and Traceroute Tool – A useful toolset that includes an alert mechanism. Nagios XI – A network management tool that includes a Ping utility. Spiceworks Network Monitor – A free, ad-supported network manager that integrates Ping. EMCO Ping Monitor – A lightweight utility for networks that uses Ping to monitor devices attached to a network. PingInfoView – A free Ping tool with a graphical interface for Windows. Dotcom-Monitor ICMP Ping Tool Monitor (Server Monitoring) – This tool triggers alerts based on Ping test results, making it a network monitoring system. Power Admin – A Ping sweep tool that is available for Windows. When choosing the tools for this list, our main considerations where the robustness of the tool in terms of diverse industry use cases, reliability, documentation and support, ease of use and software updates and maintenance. 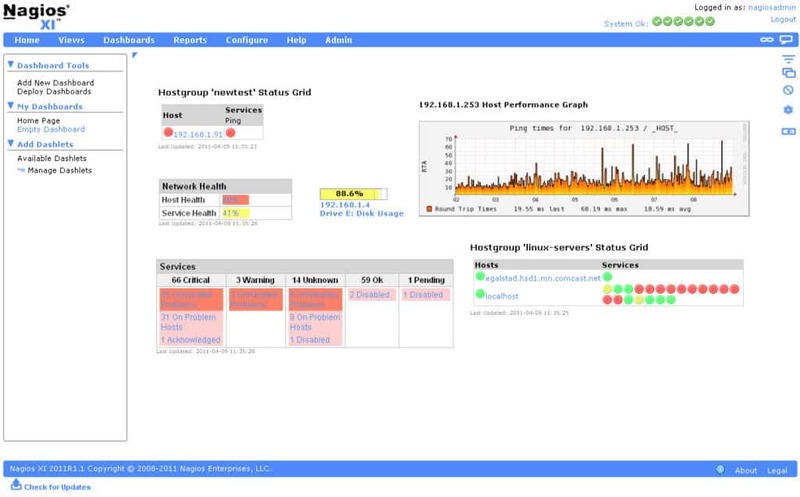 SolarWinds Engineer’s Toolset is a network monitoring tool that supports ping monitoring. SolarWinds Engineer’s Toolset offers a ping monitoring experience that can keep up with any workload. 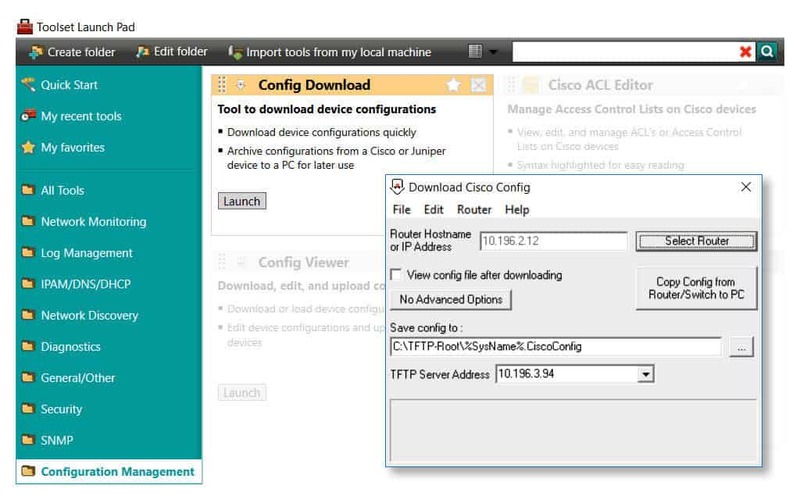 You can use an autodiscovery feature to automatically discover devices connected to your network. Once a device is connected you can then view metrics like availability, CPU load, memory utilization, and latency. All of this information provides you with the basics needed to see how a device is performing. Once you’ve pulled data from your pinged devices you can view it in the form of a graph. These graphs show real-time responses so that you’re dealing with the most up-to-date information. Once you’re finished monitoring them you can export them as image files or text files depending on your needs. While using SolarWinds Engineer’s Toolset you’re not under any pressure to catch everything that happens, as there is an alerts system in place to do this for you. The Response Time Monitor, Memory Monitor, CPU Monitor, Interface Monitor, and TraceRoute take care of this for you. This ensures that no matter what happens you are in the position to respond quickly. Overall SolarWinds Engineer’s Toolset offers a well-built ping monitoring platform. This software is as well-suited to SMEs as it is to larger organizations. SolarWinds Engineer’s Toolset starts at a price of $1,495 (£1,145) and you can also download the 14-day free trial for evaluation. Paessler PRTG Network Monitor is a very well-known network monitoring tool that delivers a first-class ping monitoring experience. PRTG Network Monitor pings devices in your network to measure their availability. With this tool, you can scan for devices to scan by IP range. PRTG Network Monitor offers a number of different sensors that can be used for ping monitoring; these include the Ping Sensor, Ping Jitter Sensor and Cloud Ping Sensor. The advantage of this sensor model of network monitoring is that it provides you with lots of detailed information. Each sensor has its own pane where you can choose between live and historic data before viewing the results on the dial displays. The Ping Sensor provides you with the basics such as ping time, minimum ping time, maximum ping time, and the percentage of packet loss. This provides you with the basic information you need to see if there’s a problem with a device. However, Paessler PRTG Network Monitor also allows you to monitor for more advanced ping concerns like jitter. The Ping Jitter Sensor allows you to measure how much network jitter there is on your network. This sensor shows the statistical jitter value and the execution time of requests. Monitoring for jitter is especially important in environments with important services like VoIP phones. Of course, PRTG Network Monitor also has notifications to alert you if any particular thresholds are exceeded. PRTG Network Monitor is also available for free for your first 100 sensors. However, those with larger networks will need to purchase one of the paid versions. The paid versions of PRTG Network Monitor range from $1,600 (£1,226) for 500 sensors to $14,500 (£11,113) for unlimited sensors. There is also a 30-day free trial of PRTG Network Monitor. ManageEngine Free Ping Tool is a free ping monitoring tool that is recommended for those looking to deploy a basic ping monitor. 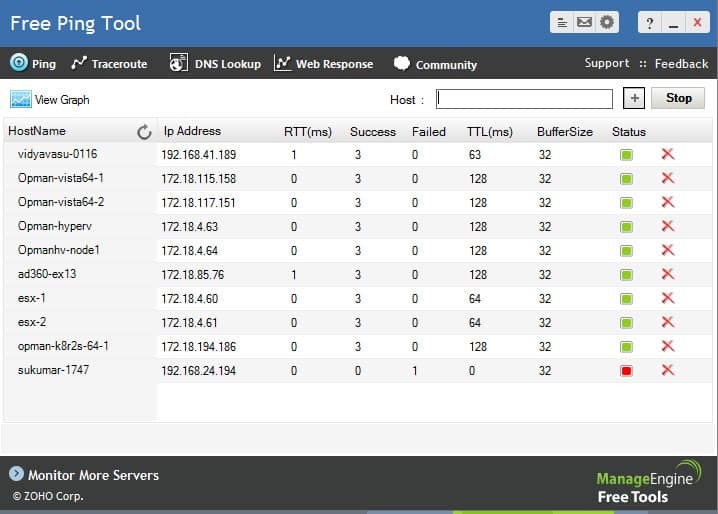 With this tool you can measure the core metrics such as round trip time, packet loss percentage, and hop number. You can also view the number of successful and failed ping counts to see how many times a device has succeeded or failed a test. Even though ManageEngine Free Ping is a basic tool, it still provides you with an easy-to-use dashboard. You can view all of the metrics on your ping tests and the color-coded status of your devices in the main table view. This allows you to view all the important information even without the more advanced displays offered by other products on this list. ManageEngine Free Ping Tool also has a notifications system. Alerts are sent to the dashboard in the event that a device is seen to be unavailable. This ensures that you never miss any information and ignore a developing problem. These alerts are based on thresholds to keep them meaningful so that you don’t get bombarded by irrelevant information. The only limitation of this tool is that you can only monitor up to 10 servers or websites at one time. This makes ManageEngine Free Ping Tool insufficient for larger organizations. However, it still offers one of the best user experiences to those who aren’t accustomed to fancier monitoring experiences. You can download ManageEngine Free Ping Tool. Nagios XI is widely regarded as one of the best network monitoring tools in the world. Yet Nagios XI offers an excellent ping monitoring experience in isolation as well. With Nagios XI you can view the availability of your devices and see how prevalent packet loss is while your network is in transition. This allows you to cut to the nuts and bolts of how well your network devices are performing. As a ping monitoring tool, Nagios XI offers a blend of modern network monitoring alongside more classic visual displays, and more advanced displays like network topology maps have also been incorporated. However, if the user design isn’t to your taste then you can customize the layout for each user. This ensures that users have complete control over how to monitor their network. For smaller organizations, Nagios XI can be downloaded for free on RHEL Linux and CentOS. You can also use Nagios XI on Microsoft but you will have to do so through the use of a VMware workstation or alternative service. As a result, Nagios XI is most simple when deployed within a Linux environment. There are two paid versions of Nagios XI; Standard Edition and Enterprise Edition. The Standard Edition is the cheaper of the two at $1,955 (£1,498). The Standard Edition provides you with all the basic monitoring capabilities, but if you want to schedule reports and create capacity planning reports you need to buy the Enterprise Edition. The Enterprise Edition can be purchased for a price of $3,495 (£2,679). You can download Nagios XI on a 60-day free trial. There are few network monitoring solutions that lend themselves as well to monitoring smaller networks as Spiceworks Network Monitor. 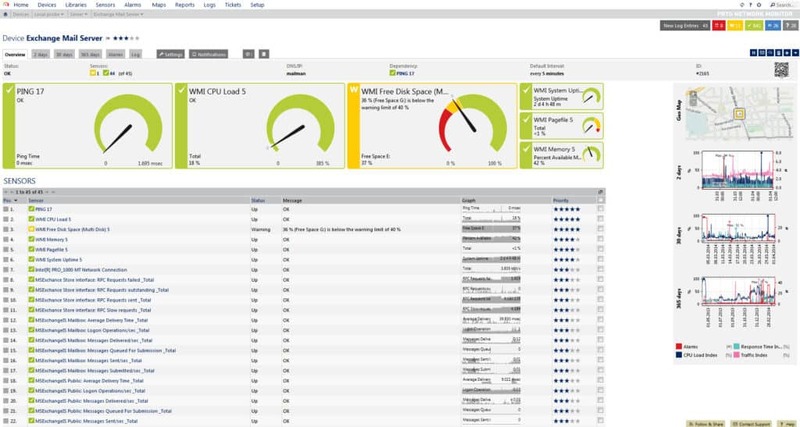 Spiceworks Network Monitor offers a free ping monitoring solution designed specifically for smaller networks. The ping monitoring capabilities of this software allow users to ping devices throughout their network and view their status. 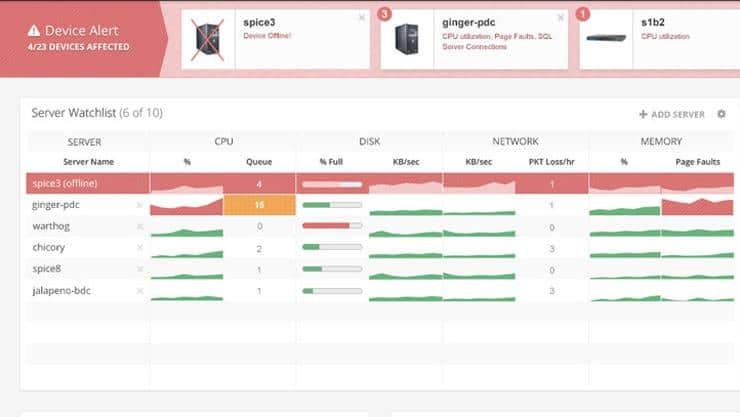 With Spiceworks Network Monitor you can view key data on CPU, disk network usage, and memory usage. All of this information is fed back to the dashboard. From the moment that you add the IP and hostname of a device, it is displayed on your dashboard. The dashboard features color-coded buttons that show whether a device is classified as up or down. Whenever you want to add a new device to this core monitoring environment you can do this manually by pressing the Add Device button. Given the production quality of the software, it is no surprise that Spiceworks Network Monitor has its own alerts system to help you stay up-to-date with network events. You will receive email alerts if any of your devices go down. You can also customize your own alert parameters so that if a ping time exceeds a certain amount of time you are notified immediately. 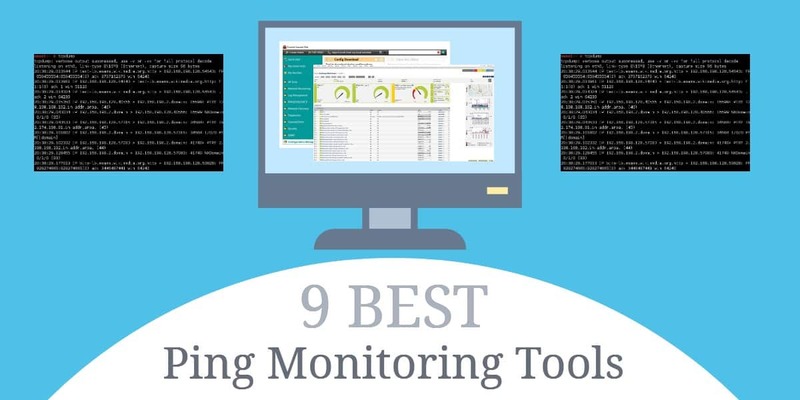 What really makes Spiceworks Network Monitor a standout product on this list is that it is free and modern. However, there is a limit on how many devices you can monitor with this program. In addition to using Spiceworks Network Monitor you need one of the following; Windows 7, Windows Server 2008 R2, or Windows Server 2012 R2. You can download Spiceworks Network Monitor directly from their site. Next up on this list, we have EMCO Ping Monitor which provides one of the most underrated ping monitoring experiences available right now. From the Host Status Overview you can see hosts across your network, their status, ping response rates, and outages information. You can monitor each host in real-time with the help of a color-coded graph to see how your connection changes over time. This provides you with a snapshot perspective so that you can see if there are any pressing issues that you need to deal with. If you want to look at your network from another perspective then you can look at your historic host data. You simply select the time period that you want to go back to for monitoring. Once you’ve retrieved this information you can create reports to send to other team members in PDF or HTML format. This simple setup keeps you close to what is going on so that you don’t get distracted by more elaborate displays. One particularly interesting feature offered by EMCO Ping Monitor is the ability to configure scripts. You can configure scripts to run once a network event happens. This is good because it allows you to incorporate a little automation into your monitoring experience. This is supported by the use of alerts which send you email notification when something changes. 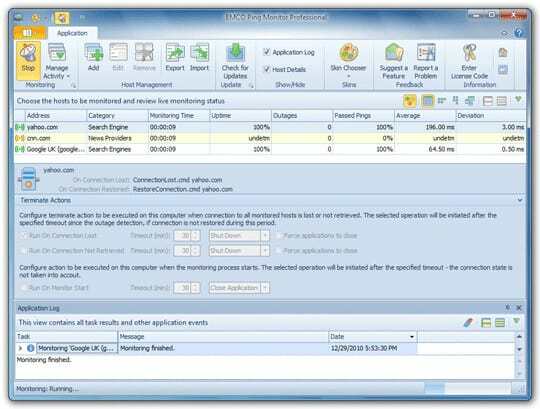 EMCO Ping Monitor is available as both a Windows program and Windows service. EMCO Ping Monitor is available as a freeware version for up to five hosts. In terms of paid versions, you can purchase the Professional Edition or the Enterprise Edition. The Professional Edition can monitor up to 250 hosts for $99 (£75) per copy or $245 (£187) for unlimited copies. The Enterprise Edition offers unlimited monitoring of hosts and costs $199 (£152) for a single copy and $445 (£341) for unlimited copies. You can also download the free trial version of EMCO Ping Monitor. PingInfoView is a ping monitoring tool for those occasions where you just want to conduct basic ping scans. With this lightweight utility, you can ping multiple host names and IP addresses at once to see whether the connection was successful or not. This information is shown in the main table view which shows you whether the connection succeeded or failed and the final ping time. Devices that are up are signified by a green button whereas those which have gone down can be identified by a red button. Even though this is a basic tool you can still schedule regular ping scans to keep your monitoring data up-to-date. You can configure PingInfoview to ping devices at regular intervals of your choosing. This ensures that your ping scan data is accurate and up to the minute. After you’re done pinging host names and IP addresses you can save the results in text, html, or xml file formats. While this tool won’t be suited to those looking for a product driven more by visualization, PingInfoView does a good job of providing the user with the basic data. PingInfoView is available for free on Windows 2000, Windows XP, Windows Server 2003, Windows Server 2008, Windows Vista, Windows 7, Windows 8, and Windows 10. You can download PingInfoView for free. Dotcom-Monitor ICMP Ping Tool Monitor is Dotcom-Monitor’s answer to ping monitoring. With this product you can send ICMP ping requests to assess the status of devices throughout your network. Ping tests are displayed in graph format so that you can track the change in responses over time. Devices that are up and running are simply marked Ok in the table below the graph view. The pressure of manual monitoring is reduced by DotCom-Monitor ICMP Ping Tool Monitor’s alerts system. The alerts system works based on thresholds and notifies you the moment a metric exceeds the predefined threshold. This means that you don’t have to keep track of the minutiae when monitoring your network; DotCom-Monitor ICMP Ping Tool Monitor does it for you. Dotcom-Monitor ICMP Ping Tool is part of the web-based Server Monitoring product that Dotcom-Monitor offers. The price of this tool is determined by the number of targets you need, and the check frequency you want to have. The price ranges from $16 (£12.27) per month for 10 targets and a 15 minute check frequency, to $120 (£92) for 100 targets and a one minute check frequency. You can download a 30-day free trial of Dotcom-Monitor ICMP Ping Tool. Finally we have Power Admin. Power Admin’s user interface looks a little outdated compared to most tools on this list but its ping monitoring abilities are just as proficient within modern networking environments. With Power Admin you can ping multiple IP addresses simultaneously. In addition, you can keep track of data on Ping tests, CPU, memory, and disk usage. This provides you with the basics needed to monitor effectively. Power Admin has its own alerts system that aims to minimize the number of alerts you receive. For instance, you only receive ping alerts if two or more ping responses haven’t been received. The alerts system also allows you to enter a variety of additional configurations. For instance, you can select the maximum response time for a successful ping, and limit alerts to events where an error has been detected for a specific period of time. Configuring alerts in this way stops you from being bombarded with notifications every time a ping request has failed! When a notification is raised you know that it is something serious that needs to be addressed. Power Admin is available on Windows. Overall we recommend Power Admin to those users who need a lean ping monitoring platform through which to ping multiple IP addresses. If you’d like to purchase a copy of Power Admin, then you’ll need to contact the company directly and fill out a short email form. There is also a 30-day free trial of Power Admin. In today’s world of fast-moving networking, ping monitoring has become a prerequisite for managing network devices. Pinging devices is one of the best ways to see if they are experiencing performance issues. In many cases, you can spot problems before they start to result in downtime if you’re looking carefully enough. However, in the event that a device goes down, you’ll be able to tell immediately by using a tool with alerts like SolarWinds Engineer’s Toolkit or Paessler PRTG Network Monitor.